The historic first Methodist preaching house. 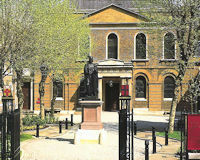 Description: This chapel was built in 1778 to replace John Wesley's earlier London chapel, the Foundery, where he first preached on the 11th November 1739. Wesley died on the 2nd March 1791 and his tomb is in the garden alongside the graves of six of his preachers, his sister Martha Hall and his doctor and biographer, Dr John Whitehead. It became the first Methodist preaching house to allow for the celebration of Holy Communion. It was commissioned by John Wesley, the founder of Methodism, and designed by architect George Dance the Younger (surveyor of the City of London). In 1891 the chapel was rejuvenated to commemorate the centenary of Wesley's death; Pillars were donated from Methodist churches around the world to replace the original and crumbling ships' masts donated by George III. On November 1st 1978, after a five-year closure due to a serious structural problem, and exactly 200 years after Wesley opened the Chapel, the buildings were reopened in grand style in the presence of Her Majesty Queen Elizabeth II and the Duke of Edinburgh. In 1989 Wesley's Chapel and near neighbour the Leysian Mission joined together and today receives thousands of pilgrims and visitors each year visiting the Mother Church of World Methodism. Wesley described his Grade I listed chapel as 'perfectly neat but not fine' and it is a fine example of Georgian architecture. The site also features an original toilet/gentleman's convenience built by the sanitary engineer Thomas Crapper in 1891 (later restored in 1972). Margaret Thatcher married businessman Denis Thatcher here in 1936 and both her children were christened here. She liked it so much that she donated the communion rail.